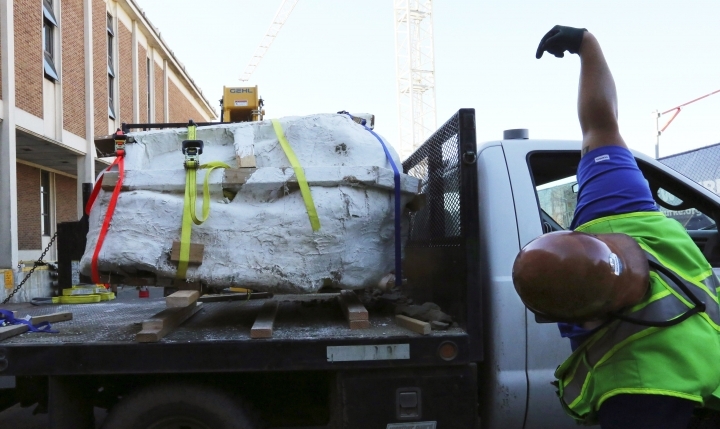 SEATTLE — Paleontologists with Seattle's Burke Museum have unearthed the bones of a Tyrannosaurus rex that lived more than 66 million years ago, including a rare nearly complete 4-foot long skull. The remarkable discovery includes the dinosaur's vertebrae, ribs, hips and lower jaw bones, and represents about 20 percent of the meat-eating predator. Several dozen scientists, volunteers, students and others worked over the summer to excavate the bones in the Hell Creek Formation in Montana, a site well known for fossil finds. 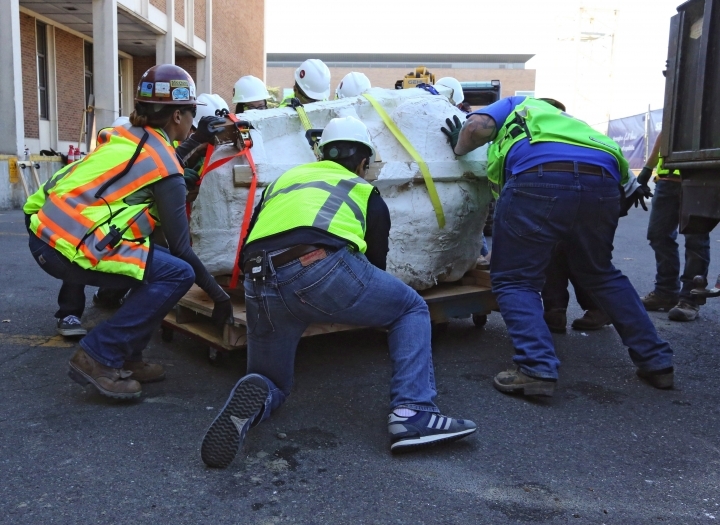 The team later encased the massive skull in a protective plaster cast, lifted the 2,500-pound load onto a flatbed truck with the help of local Montana ranchers and drove it to Seattle. 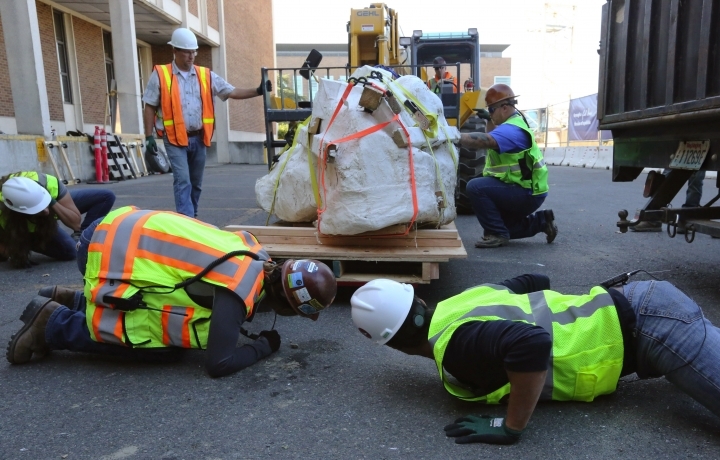 The skull was unloaded at the Burke Museum Thursday. The plaster-covered skull will be on display to the public for several weeks starting Saturday. Over the next year, paleontologists will painstakingly work on removing the rock around the skull. Scientists estimate the dinosaur is 85 percent the size of the largest T. rex discovered and, based on the size of its skull, lived about 15 years. They believe this T. rex roamed the earth in the late Cretaceous period. 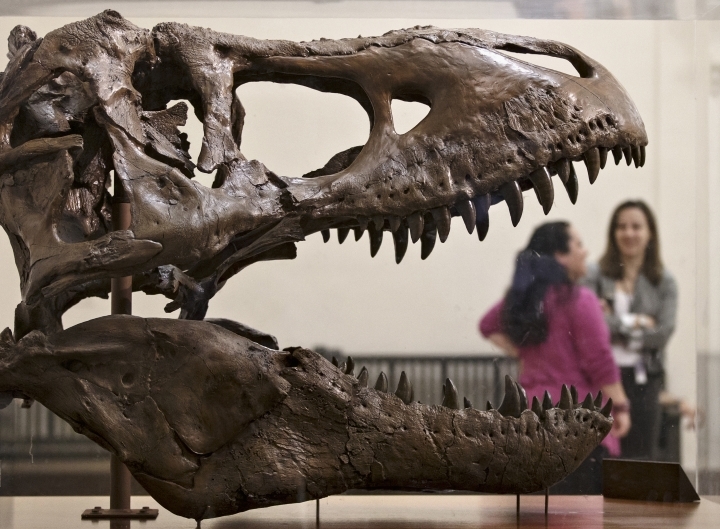 There are only 14 other nearly complete T. rex skulls that have been found, the museum said. "We think the Tufts-Love Rex is going to be an iconic specimen for the Burke Museum and the state of Washington and will be a must-see for dinosaur researchers as well," Gregory Wilson, a University of Washington biology professor and adjunct curator of vertebrate paleontology at the Burke Museum, said in a statement. He led the expedition team. 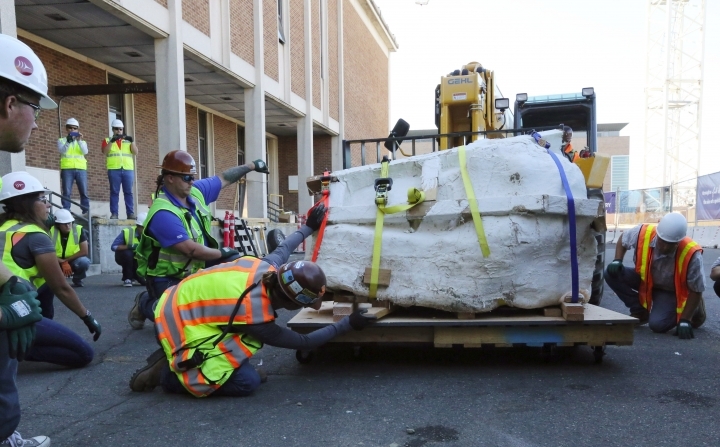 The T. rex is named after two museum paleontology volunteers, Jason Love and Luke Tufts, who were combing for fossils when they came across large fossilized vertebrae sticking out of a rocky hillside last summer. The two were with a team collecting fossils as part of the Hell Creek Project, currently led by Wilson and started by Jack Horner, who discovered the world's first dinosaur embryos, and Nathan Myhrvold, former Microsoft chief technology officer who is a Burke Museum research associate. The team knew the fossils belonged to a meat-eating dinosaur because of the large size and appearance of the bones, but they weren't sure whether it was a T. rex. They didn't have the chance to excavate further until this summer when they returned to the site. 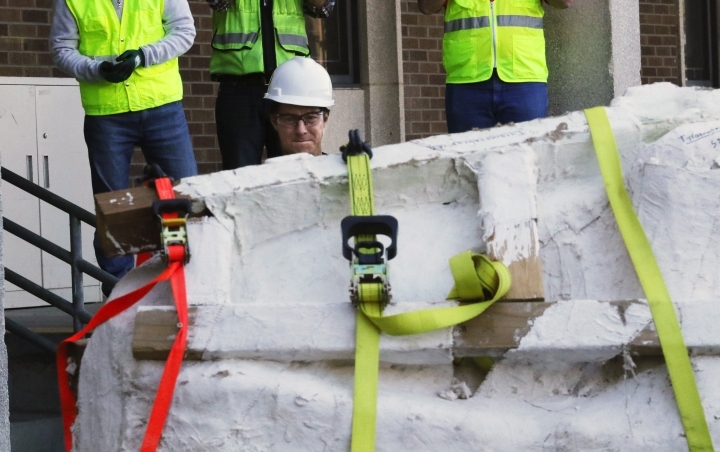 Over the course of a month, Burke paleontologists and others used tools such as jackhammers, axes and shovels to dig up the bones. They first removed about 20 tons of rock and then dug further to uncover pelvic bones and other parts. More digging led to the most amazing find: the right side of the T. rex skull, including snout and teeth. Scientists think the other half of the skull is there as well. They plan to return to the site next year to search for that and other dinosaur parts. Horner, a Burke Museum research associate who built a vast collection of dinosaur specimens while at the Museum of the Rockies in Bozeman, Montana, said in the statement that the discovery was "one of the most significant specimens yet found."